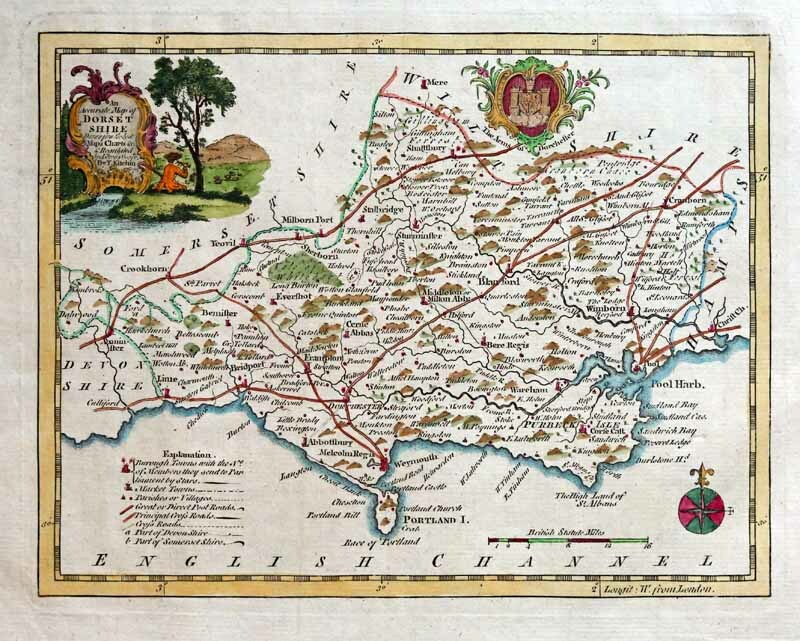 An attractive and neatly engraved 18th century map of Dorset, by Thomas Kitchin, described as “An Accurate Map of Dorsetshire Drawn from the best maps, Charts &”which appeared in Henry Boswell’s Antiquities of England & Wales (London: Alexander Hogg, 1786 – 1798). Thomas Kitchin (1718-1784) was one of the most eminent and prolific cartographers of the 18th Century producing many fine maps and atlases. Printed area is approximately 21.5 x 16.5 cms (8.5 x 6.5 ins). The cartouche in the upper left is incorporated in an idyllic rural scene with a shepherd apparently with a telescope watching over his flock. Shows the parts of Devon and Somerset in Dorset (labelled a and b) and following earlier maps (e.g. Thomas Bayly 1773) shows the number of Members of Parliament returned by boroughs by stars.